You’d need a lot of sleepless nights to keep up with the changing environment in GIS. We are constantly looking at where you can improve efficiency. We’ve picked up quite a few ArcMap tips and tricks over the years. These quick ArcMap tips and tricks have been whittled down to only the best. MXD stands for Map eXplorer Document. ArcMap uses this GIS file format to store and display map layers. You can also use geoprocessing tools and change map layouts in MXDs. Over the years they’ve gotten a bad reputation for crashing. This is why we have saving your work as rule #1. Before adding an ArcGIS online basemap or any type of large dataset, save your MXD. Actually, save your work and save often. Not only your MXD, but save your edits when digitizing. The frustration of losing edits might make you want to throw your computer out the window. The damage is not as bad if you’ve saved your work. Save your MXD. Save your edits. Save time. Definition queries are useful in so many ways. Definition queries use simple SQL statements to limit the features being displayed in a MXD. For example, “STATUS=”CITY”” will only include cities in your MXD. “STATUS in (“CITY”,” TOWN”, “COUNTY”)” would only be cities, towns and counties. “STATUS not in (“VILLAGE”,”METRO”, “STATE”)” would not include villages, metro areas and states. When you export a shapefile with a definition query, only these features in the query will be in the end result. That’s much better than exporting all and deleting records. Use definition queries. Limit your output. Automating your workflow can be a big time saver. This comes in the forms of: Batch processes, model builder and Python code. Batch processes are great for automating redundant tasks. Batch processes run the same tool multiple times to different files. The alternative? Manually processing each file. Similarly, model builder does the GIS programming for you. Instead of running the same tool repeatedly, model builder can run a set of different tools in a certain order. When model builder cannot perform the operations, Python code will more than likely be able to automate your workflow. This takes a bit of coding skill, but learning Python is well worth the time and effort. A good quick tip is to build a model similar to what you need done. The Python code can be exported from model builder. This makes a better starting point then writing code from scratch. Automate workflow with batch processes, model builder and Python code. Shed away hours of manual work. ArcGIS has had issues in the past when printing from MXDs. It was a bug that was always there just waiting to crash an unknowing victim’s computer. Bottom line is that MXD and printers are not the best of friends. It’s another one of those quirky ArcMap bugs that turns your smile upside-down. 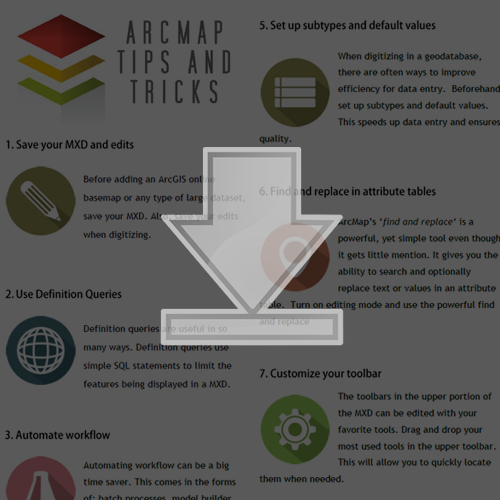 This makes a good chance to review ArcMap Tips and Tricks #1 again: Save your MXD often. Never print from a MXD. Export as a PDF. Print the PDF. When digitizing in a geodatabase, there are often ways to improve efficiency for data entry. A subtype is a drop-down list that restricts which values can be entered. When entering attribute information, the user can select a predefined list of values. This also ensures correct values are being entered. Another option is to set up default values. If a specific value is more common than another, it would make sense that a default value is already there when creating a feature. Just make sure you change the default value, if it is different. Set up subtypes and default values. Speed up data entry. Ensure quality. The find and replace tool has always been handy in Excel. But did you know that it also exists in ArcMap attribute tables? ArcMap’s ‘find and replace‘ is a powerful, yet simple tool even though it gets little mention. It gives you the ability to search and optionally replace text or values in an attribute table. This is one of those tips and tricks in ArcGIS that really extends your ability of how to edit attribute table data. Please note: Editing mode needs to be turned on to access this tool. Find and replace text and values in attribute tables. Some of us often use the same tools in an ArcMap session. You’re working hard at your desk and want to locate these tools as quick as possible. There is an easier way to do this then searching for the same tool every time. The toolbars in the upper portion of the MXD can be edited with your favorite tools. Drag and drop your most used tools in the upper toolbar to quickly locate them when needed. Customize your toolbars. Locate tools with ease. Shapefiles can really start to pile up when you are running different geoprocessing tools. There is a way to prevent this from happening in ArcMap. Under ‘geoprocessing options’, you have the option of overwriting outputs. After this option is turned on, you will be able to overwrite existing shapefiles. Be careful which outputs you overwrite though. It’s not easy recovering an overwritten shapefile. Overwrite output is available. Create new output by overwriting pre-existing shapefiles. This is the list of what we found as the most valuable Esri ArcMap tips and tricks. Next time in an ArcMap session, follow these golden rules and you’ll be able to save time and improve workflow. As we’ve learned, there are exceptions to every rule. Tell us where we have gone wrong in this list. We are hoping to make this list a dynamic one. Share us your ArcMap tips and tricks. We hope to expand this list with some great input from our readers. Take a look at the ArcMap Tips and Tricks checklist below. Mark what you already know and where you can improve your skills. The Attribute Assistant add-in is able to save an editor a ton of time and rescue them from data entry errors.